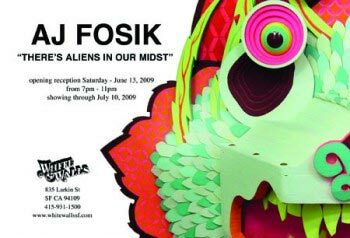 There’s only 10 days left to this epic show at White Walls Gallery in San Francisco, but if you haven’t scoped out Philly-based artist AJ Fosik‘s new works yet, get over to White Walls right away!!! Fosik offers a brand new rendition of classic wall-mounted animal heads using thin sheets of cut wood, nails, and paint. The show, entitled Aliens In Our Midst, features mythical beasts crafted in a way that makes them reminiscent of ’80s neon color palettes meets Eastern architectural ornamentation. See more of his recent work on his Flickr or MySpace.